Today, splurging on high street brands in malls is our go-to when we want to shop. Whether it is home decor, casual Indian wear or footwear, we head to the closest mall, don’t we? Yes, it is sort of a no-brainer in 2018 but TBH, malls may never be able to replace some local hotspots with old world charm, exquisite products and - this is the best part - pocket-friendly prices. 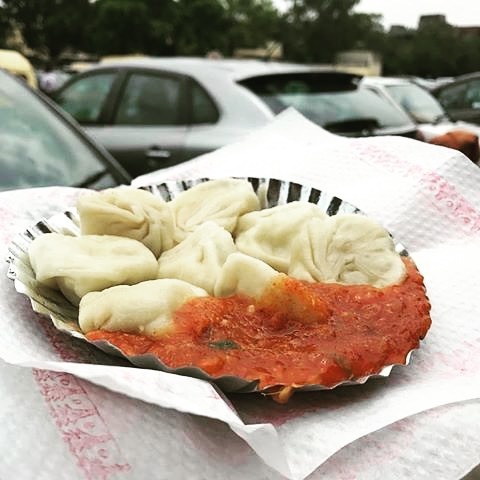 In Mumbai, it’s the Colaba Causeway, in Bengaluru it’s the MG Road market and in Delhi, it is the Lajpat Nagar market aka the Central Market. 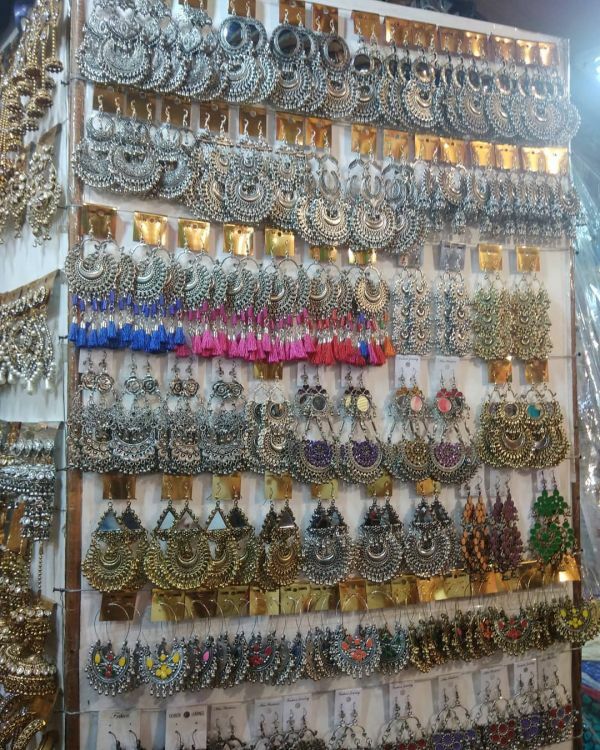 When it comes to shopping in Delhi, there is barely anyone who wouldn’t know about the Lajpat Nagar market. Situated in the heart of south Delhi, this vast marketplace is always bustling with shoppers. This local marketplace will blow you away with its variety across categories, designs and discounted prices. Not only does one fall in love with the Central Market’s product offerings but also its numerous street food joints. After all, if you’re going to shop all day, you need fuel, don’t you? The market is situated in Lajpat Nagar, a commercial and residential area in the southern district of India’s capital, New Delhi. The locality is divided into Lajpat Nagar I, II, III and IV and is easy to get to from most parts of Delhi. Lajpat Nagar II is where the popular Central Market is located and it is open 6 days a week. 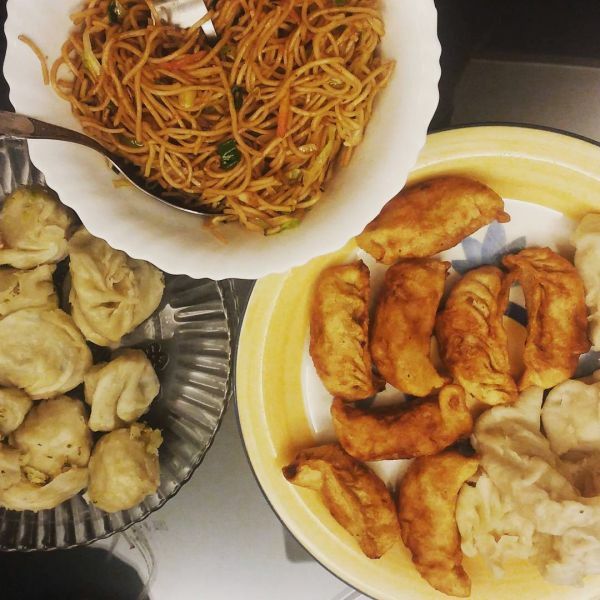 Plan your visit accordingly to make the most of your time at the Lajpat Nagar market. All iconic places have an iconic history, don’t you think? As does the Lajpat Nagar market and where it all started. 1. The partition of India in 1947 actually resulted in the development of Lajpat Nagar in the 1950s. Interesting, huh? 2. Most of Lajpat Nagar’s early residents were Hindus and Sikhs, who had just moved to India from the newly formed Pakistan. Majority of these were, in fact, Sindhis and Multanis. 3. Refugees from the partition camped up at Purana Qila and were later allotted residential plots in other parts of Delhi, including Lajpat Nagar. The colony also housed Bengali widows at a refugee camp, now the Kasturba Ashram. What we love about Central Market is that it opens up to the public quite early in the morning in comparison to other markets. While most shopping spaces open up by 11-11:30 am, the Central Market in Lajpat Nagar opens at 10 am and closes down at 9 am. Even though the market is open until 9 pm, it’s best to go when the footfall is least. So, visit Lajpat Nagar market either between 10 am and 11 am or 3 pm and 5 pm. This way, you’ll avoid the crowd at the popular stores and shop more efficiently. Lajpat Nagar market is open six days a week. It is only shut on Mondays, which is when the retailers refresh their stock and receive new pieces. Tuesday is the best day to visit Lajpat Nagar because you get to pick from new variety. 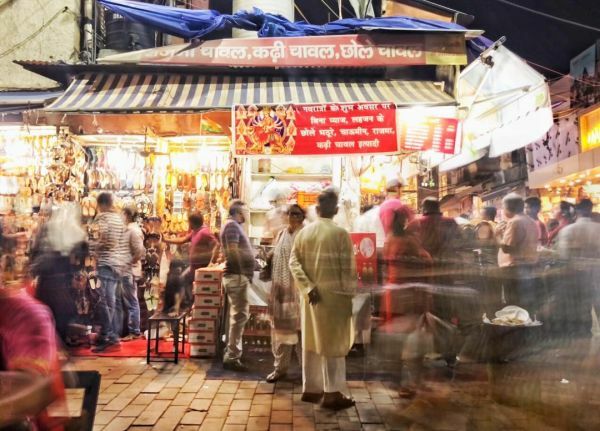 One other great thing about the Lajpat Nagar market is that it is accessible from all parts of Delhi easily and is located in the heart of the city. No matter where you’re coming from, it won’t take very long to reach Lajpat Nagar Market, whether you’re travelling by car, bus or the metro. 1. East Delhi: If you are a resident of East Delhi, you can take routes 543, 309 or 450 to commute to Lajpat Nagar market. 2. South-West Delhi: There are a number of routes from close to Vasant Kunj, which are routes 604, 507, 450, 717 and 423. 3. South Delhi: Get on route 423 if you’re travelling to Lajpat Nagar from South Delhi. 4. North Delhi: Routes 729 and 425 will get you to Lajpat Nagar if you’re travelling from the Northern district of New Delhi. The Lajpat Nagar market is seamlessly connected by the Delhi Mass Rapid Transit System or the Metro. 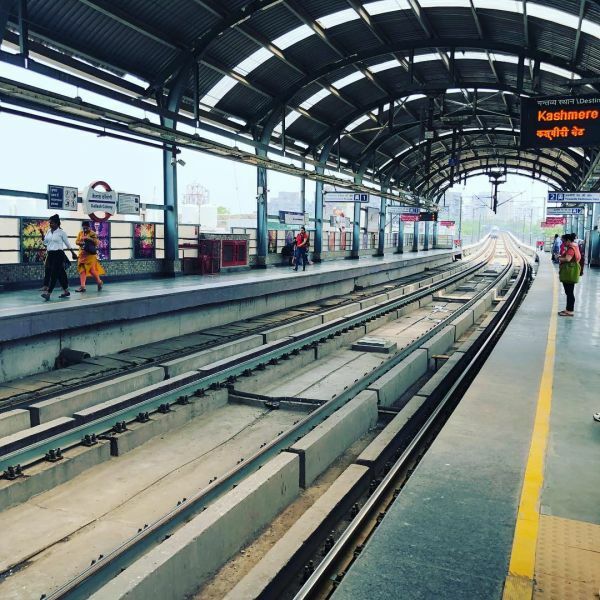 The Lajpat Nagar Station of the Delhi Metro falls on the Violet line and is located between the Jangpura and Moolchand metro stations. Whether you’re travelling from Noida or Naraina, Gurgaon or Greater Kailash - the metro will get you to Lajpat Nagar market without any hassle. Another metro station is under construction and scheduled to open soon, making it easier for you to visit the market. 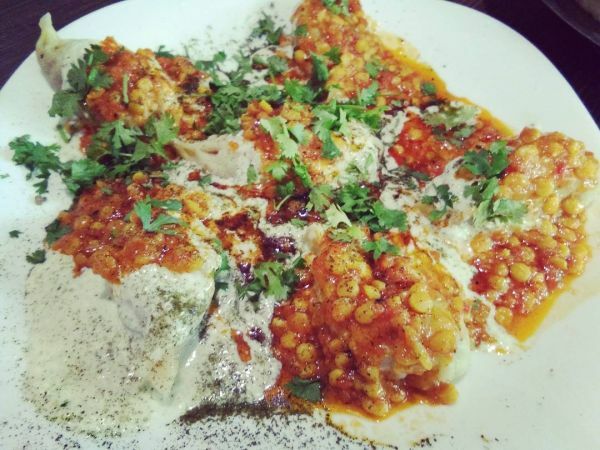 Lajpat Nagar will spoil you for choice. You can find everything from clothes to footwear to household items here and at affordable prices. We have picked our favourites to give you a head-start. 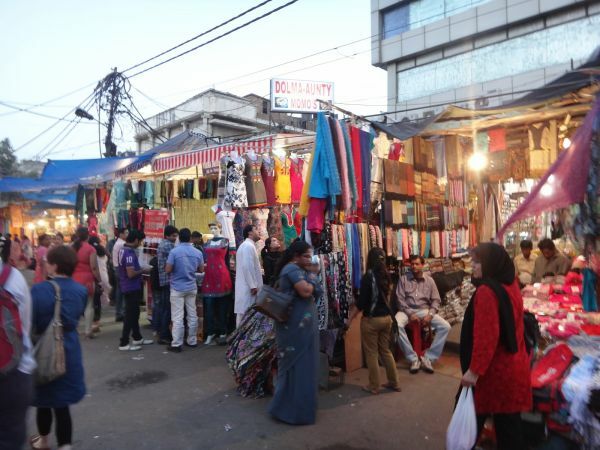 There are so many things to do at Lajpat Nagar Market but if you go to the market and come back without visiting the cloth market, you would really be missing out on something. From embroidered and embellished fabric to printed pieces, the market’s cloth retail scene is undoubtedly one of the best in the city. When you’re particular about the fit and fabric quality of the clothes you wear, there’s nothing that beats buying your own and getting it tailored. When it comes to fabric, Lajpat Nagar has a number of stores that will fulfil all your cloth needs. Not only does buying your own fabric ensure that you have the silhouette you want and the quality you need, but it is also a much pocket-friendlier option than giving in to exorbitantly priced clothes. The Lajpat Nagar Market fabric shops check all the boxes. 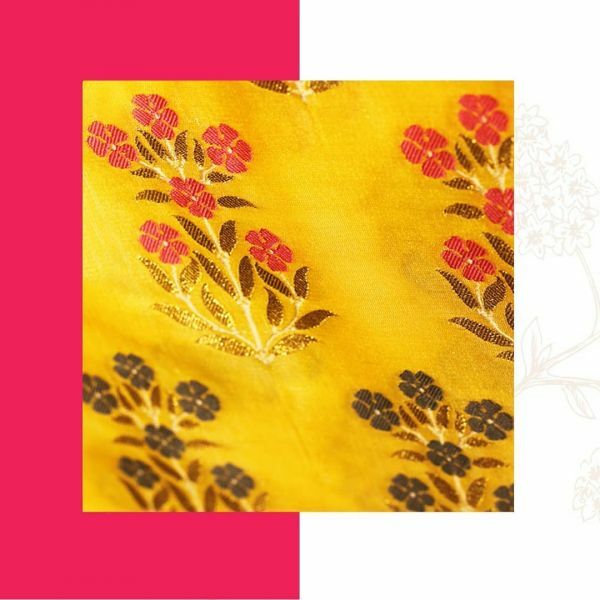 The variety you will find amongst the stores would be matchless, especially when it comes to fabric for bridal garments, Indian party wear and everyday wear. This fabric shop in Lajpat Nagar market will exceed all your expectations. If you’re a big Bollywood fan, be prepared to find fabrics your favourite stars have been wearing on AND off-screen. From vibrant silks to gota work organza, you’ll find what you’re looking for at Ramjisons. A boutique cloth shop in Lajpat Nagar market, Hastkala is your place if you want some nice suits in your wardrobe - unstitched, stitched, fabric, dupattas et al. Another fabulous fabric shop for clothing in Lajpat Nagar Market, KC Creations offers a variety of Banarasi silks, embroidered velvet, cotton suit fabrics… and more. If you want to make a statement, this store is your best bet. From fringe detail to a sequin overload, there’s so much to choose from. One of the oldest and biggest fabric shops in Lajpat Nagar, Monolisa has a stunning brocade net collection as well as crochet and lucknowi chikan borders. You will love the collection of fabrics at this store in Lajpat Nagar market. Especially their chanderi zari cutwork variety and embroidered net. In one of the by-lanes of the central market of Lajpat Nagar, this store will make your day with a huge selection of trims, borders and latkans. From kundan work, zari cutwork to rhinestone studded work, Prakash Collection has it all. 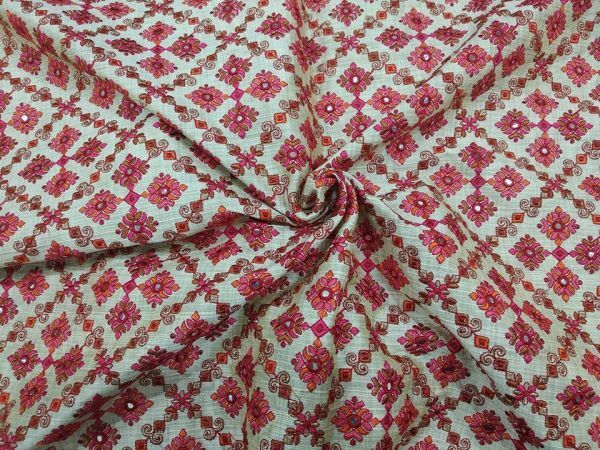 Check out other fabric markets in Delhi for the perfect pick for your Indian wear here. Also, keep these things in mind if you want to get your bridal lehenga custom-stitched. Brighten up your home and home furniture with fabric shops that offer the best selection of upholstery and curtain fabrics. Check out the cushion covers and bedsheets at this store. The store also offers curtains, pillows, floor mats, carpets and blankets. Again, if you’re looking to change up your bedroom style, this store in Lajpat Nagar is your best bet. You will find pretty curtains, cushion covers, floor mats, carpets, bed sheet and blankets here. Another great fabric shop in the market to explore for home furnishings is Sita Fabrics. This is a street shop in Lajpat Nagar market but stocks interesting curtain fabrics for curtains. They also have mats and carpets. Yes, Lajpat Nagar market has a plethora of options for footwear too! 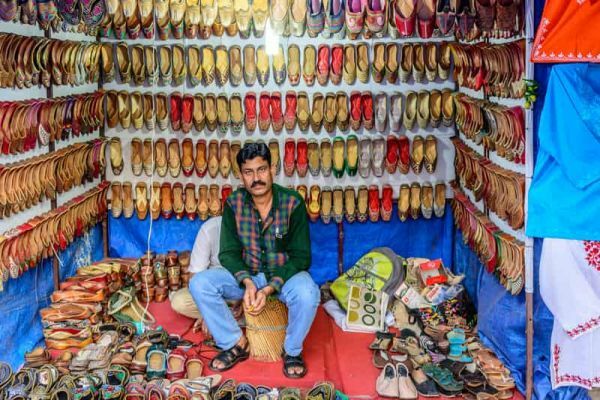 Head to the street vendors for some lovely ethnic footwear that is also affordable. For more options, both western and Indian, there are a series of stores you can check out. From party sandals to pumps for work, it’s all here at the Central market. There are a number of jutti stalls opposite KFC in the Lajpat Nagar market. The key to getting the perfect pair at these jutti stalls is to bargain, as their prices are competitive. With the arrival of the festive season and wedding season, these stalls are a must visit. Speaking of festivals and weddings, you and I both know the ideal outfit is incomplete without the most stunning jewellery to complement it, don’t we? 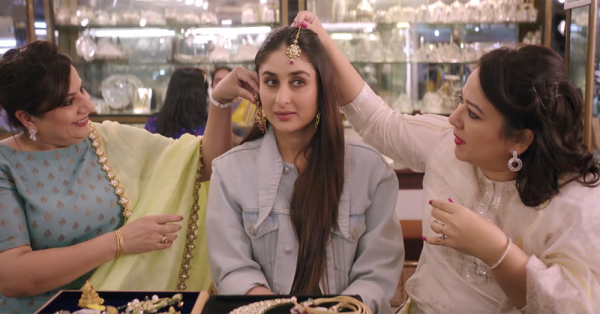 For someone who loves dressing up but doesn’t like being broke, the trick is to go for artificial jewellery, which if kept with care, will last you all through the season. For when you don’t have time to buy fabric, go to the tailor and get fittings done for a great Indian outfit. There are stores that sell ready-to-wear traditional wear at Lajpat Nagar market. A trustworthy name when it comes to ethnic wear, there is no need for introduction with Shakuntalam at Lajpat Nagar market. Whether it is lehengas, heavy sarees or suits, your shaadi wear needs will be met at this store. 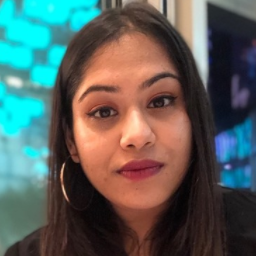 What you will love is that their clothes appeal to the modern Indian woman as well and keep up with all the latest fashion trends. Another known name for Indian wear, Malhotra’s is located in the heart of the main market and is a definite must-visit for the shaadi-goer’s fashion needs. 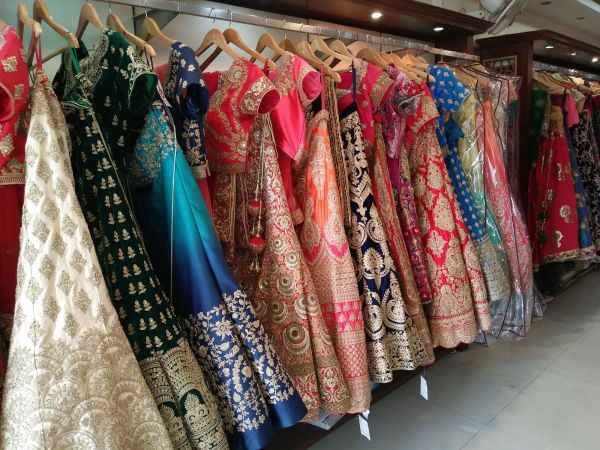 From bridal lehengas to sarees and suits, the store stocks up all of these for different budgets. This store has as much to offer for men as it does for women. Their incredible collection of silk sarees and bandhgalas is worth visiting this store for. Also, stop your hunt for your trousseau outfits already because Roop Mandir is what you’re looking for! Although it’s tucked in a tiny little lane of the ever-crowded central market, Nargis Fashion is a known brand at Lajpat Nagar market. The local shopkeepers will guide you to it, in case you’re confused at any point about its location. Skip spending wads of cash on your bridal trousseau and find a wide variety of lehengas, sarees and suits at reasonable prices at Nargis. Everyone knows buying each and every outfit from a designer store is just going to leave you broke after your wedding. At Dress Like Celebrity, you can rent bridal outfits and save on the extra expenditure. Smart, right? They have a number of lesser-known designer pieces and we bet you will find something you love right here. Want to rent bridal lehengas? There are also many websites online that rent out designer lehengas for your special day! No one goes to Lajpat Nagar market for just the clothes! As stunning as the rest of the products there are, it’s a must to explore the wide range of eateries in the locality. 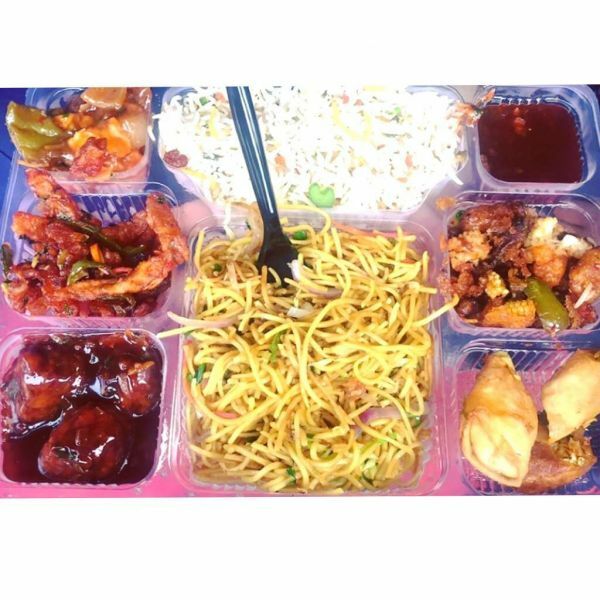 From chaat to Chinese, the options are mind blowing! Here are all the joints that you need to visit when you’re in Central Market… after all, food makes everything better, doesn’t it? Missing shawarmas from the list? Here are all the shawarma places that are a must-visit if you can’t get them off your mind. Love street shopping? 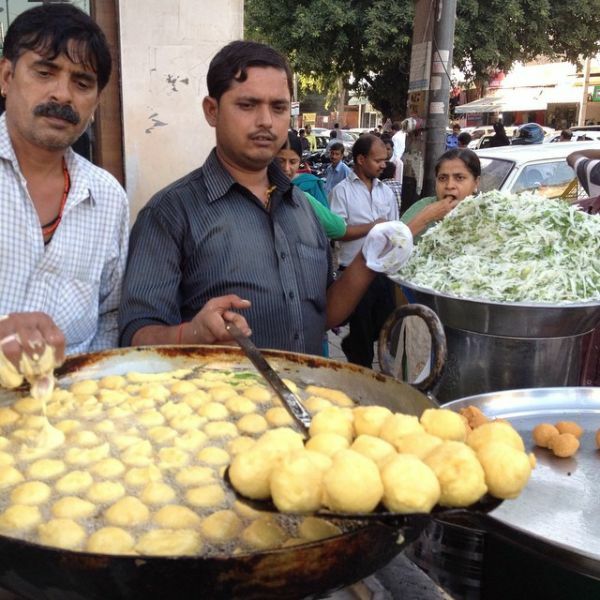 One more market worth checking out in Delhi is the famous Sarojini Nagar market. For wedding shopping, checkout Chandni Chowk Market. Here are some smart bargaining tips you should keep in mind before heading to S.N. Happy shopping!